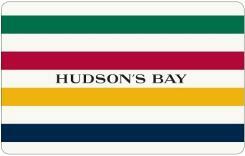 Convenient and easy to use, the iconic Hudson's Bay Gift Card offers compelling shopping experiences at 90 Hudson's Bay locations nationally and online at thebay.com (also redeemable at 66 Home Outfitters locations). Hudson’s Bay is Canada’s largest and most prominent department store, unsurpassed in its premier fashion, beauty, home and accessory designers and brands. Home Outfitters is Canada’s largest kitchen, bed and bath superstore, with an unbeatable selection of chic designer collections and favourite national brands. Your gift code will be emailed to you and posted on your account profile, under "My Gift Cards" within 10 business days of verifying your purchase.